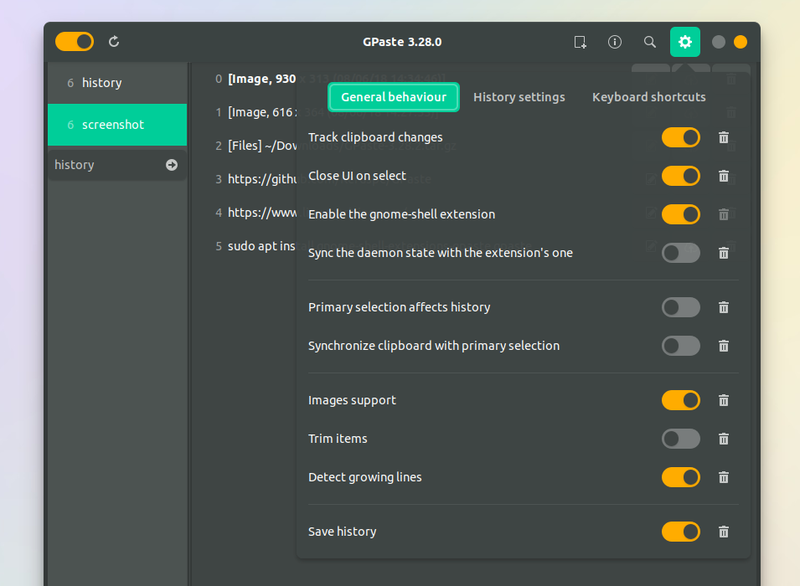 GPaste is a clipboard management system that consists of a library, daemon, and interfaces for the command line and Gnome (using a native Gnome Shell extension). A clipboard manager allows keeping track of what you're copying and pasting, providing access to previously copied items. 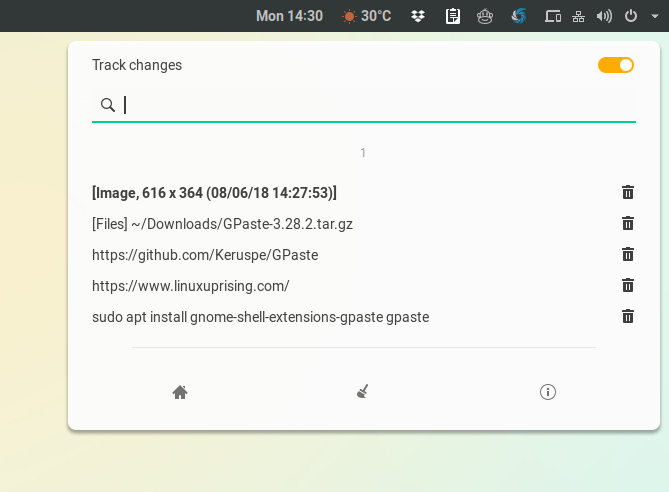 GPaste, with its native Gnome Shell extension, makes the perfect addition for those looking for a Gnome clipboard manager. 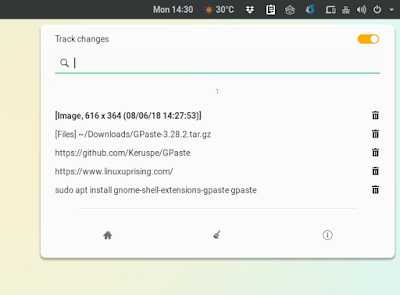 Using GPaste in Gnome, you get a configurable, searchable clipboard history, available with a click on the top panel. GPaste remembers not only the text you copy, but also file paths and images (the latter needs to be enabled from its settings as it's disabled by default). What's more, GPaste can detect growing lines, meaning it can detect when a new text copy is an extension of another and replaces it if it's true, useful for keeping your clipboard clean. From the extension menu you can pause GPaste from tracking the clipboard, and remove items from the clipboard history or the whole history. You'll also find a button that launches the GPaste user interface window. If you prefer to use the keyboard, you can use a key shortcut to open the GPaste history from the top bar (Ctrl + Alt + H), or open the full GPaste GUI (Ctrl + Alt + G). The GPaste interface window provides access to the clipboard history (with options to clear, edit or upload items), which can be searched, an option to pause GPaste from tracking the clipboard, restart the GPaste daemon, backup current clipboard history, as well as to its settings. The Gpaste project page does not link to any GPaste binaries, and only source installation instructions. Users running Linux distributions other than Debian or Ubuntu (for which you'll find GPaste installation instructions below) can search their distro repositories for GPaste. Do not confuse GPaste with the GPaste Integration extension posted on the Gnome Shell extension website. That is a Gnome Shell extension that uses GPaste daemon, which is no longer maintained. 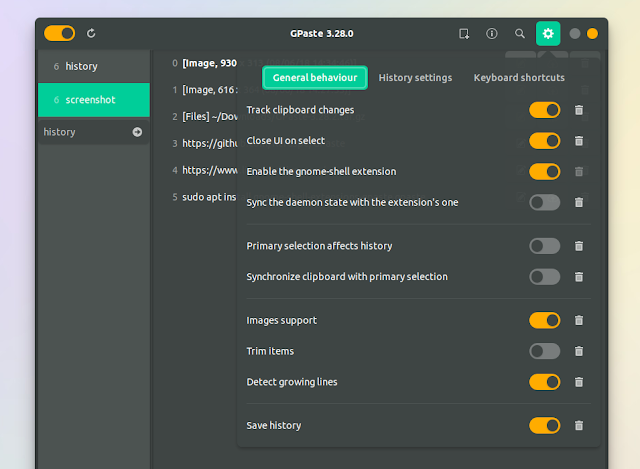 The native Gnome Shell extension built into GPaste is still maintained. For Debian, GPaste is available for Jessie and newer, while for Ubuntu, GPaste is in the repositories for 16.04 and newer (so it's available in the Ubuntu 18.04 Bionic Beaver). After the installation completes, restart Gnome Shell by pressing Alt + F2 and typing r, then pressing the Enter key. The GPaste Gnome Shell extension should now be enabled and its icon should show up on the top Gnome Shell panel. If it's not, use Gnome Tweaks (Gnome Tweak Tool) to enable the extension. The GPaste 3.28.0 package from Debian and Ubuntu has a bug that makes it crash if the image support option is enabled, so do not enable this feature for now. This was marked as fixed in GPaste 3.28.2, but this package is not yet available in the Debian and Ubuntu repositories.